June 6, 1944 and the greatest armada in military history is assembled in England for an assault on Hitler's Fortress Europe. For this long awaited D-Day the Allies have assembled 12,000 planes to protect a surface force of 4,000 ships. 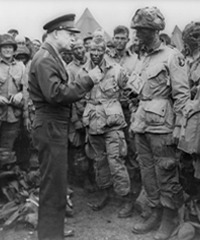 Supreme Commander Dwight D. Eisenhower has nearly 3,000,000 men trained for the assault. Combat cameramen made a great pictorial record of this day - a day that changed the course of history. A myriad of soldiers that are on their way to a transport ship. MS - A line of military ambulances. MS - A row of army tanks. MS - An air field full of different types of fighting planes and bombers. MCUS - General Eisenhower and General Montgomery looking over battle plans. Armada of military battleships and transport ships. Aerial shot - British and American bombers bombing Germany. Aerial shot. Bombs exploding leaving a trail of smoke and fire. Looking up - A formation of military planes in the sky. MCUS - Paratroopers jumping out of a plane, US 101st and the British 6th, dropping out of the sky's over Normandy. Looking up - Sky filled with paratroopers and planes. MS - Battleship firing its cannon. MCUS - Military troops climbing rope ladders into a duck or transport boat that will take them to the shores of Normandy. MS - Battleship firing its canon at the German troops in Normandy. CUS - Troops huddled in one of the army ducts on their way to Normandy beach. MS - Troops landing on Normandy beach. CUS - Medics carrying a wounded soldier. CUS - A bare chested soldier standing at the bottom of a cliff on the beach. Aerial shot - The military ships and the ducts on Normandy beach. 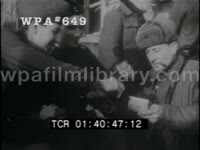 MCUS - General Eisenhower shaking hands with an German officer under surrender. MS - German soldiers with their hands up in the air surrendering. MS - Wounded soldiers transported by army jeep. MCUS - German troops under surrender. Master 1495 - Tape 2 Map of Northern France, English Channel and Southern England with French cities of Calais, Dieppe, Le Havre, Cherbourg, and Brest marked. LS explosions in field. Rear view TLS U.S. APC (armored personnel carrier) driving through wide-open field. Rear view TLS U.S. APC and M4 Sherman tank driving through coastal village; great head-on TLS M4 Sherman tank driving through village. Panning TLS APC (looks amphibious) towing trailer. Sideview TLS U.S. Military Police (MP) Corporal directing armored battalion of light tanks. TLS military lorries driving along dock, passing cam. TLSs military truck backing onto T-453 landing craft; MS tires backing through shallow pool of water. TLSs APC and amphibious vehicles backing onto carrier craft. Rear view MS U.S. Army soldiers marching onto carrier. TLS/MSs U.S. soldiers boarding pontoon landing crafts (LC). High angle TLS LC loaded with soldiers sailing off. H/a TLS landing craft loaded with soldiers. H/a MSs soldiers on LC roped to naval ship. MSs soldiers using ropes to board ship from LC. MS U.S. Navy sailors helping U.S. soldiers board. Brief MSs soldiers playing craps (dice) on deck -- note the presence of at least two MPs. MS Army officer peering through deck sights. L/a TLS soldiers alighting boat to LC using ropes. H/a LC being lowered into water. LS/TLSs LCs sailing, embarking for shore. WLS/LS/TLSs naval salvo, providing cover barrage fire for landing soldiers; naval deck artillery fire. LSs LCs sailing for shore. LSs Allied soldiers storming beachhead. Great head-on TLS U.S. Army soldiers storming beach, running toward camera. Panning TLS soldiers running with M1 Garand rifles, hitting the dirt. Panning MS soldier running with Browning Automatic Rifle (BAR 1918A2) with bipod, falling into foxhole. Panning MS soldier running with light (short round) bazooka, hitting dirt. Nice MS ground explosion, dirt flying everywhere. TLSs LCs providing cover fire for landing troops. LS Allied troops landing on beach marked by steel barricades. MS soldiers carrying wounded on stretcher along rocky shore. MS U.S. soldiers sitting huddled on beach. RV TLS British or Canadian soldiers boarding LC. RV MS Brit or Canadian soldiers filing off LC during invasion. Great MS American soldiers with heads bowed solemnly. TLS/MSs 101st Airborne (Screaming Eagles) paratroopers marching past camera at base during pre-invasion preparations. The D-Day Invasion. MCU bullets being loaded into curved automatic rifle clip. Quick MS British soldier inspecting pistol. MCU British Sten Gun submachine gun being locked & loaded. CU pineapple grenade being slipped into pouch. MCU knife being sharpened on wheel. TLS/MSs U.S. 101st Airborne Division paratroopers (Screaming Eagles) donning gear outside plane, then boarding it; TLS transport plane bearing D-Day markings taxiing; MS U.S. officer saluting plane. MS aboard pontoon boat wading in shallow waters along Normandy beachfront; door is opened and British (Canadian?) soldiers step off. Wide LS misty beachhead, soldiers storming. LS/MS German radar sentry in occupied France. VO narrates. TLSs Nazi troops (352nd Wehrmacht?) zipping along tree-lined country road. MS German soldiers, troop division marching pith helmets. TLS Atlantic wall, pad de calais. MS German soldiers entering ornate bunker. MS German naval officers inspecting Atlantic Wall fortifications. MS howitzer hidden in bushes, turret peeking out. LS Channel, English coast in distance. MSs Nazi sentries on patrol along Atlantic Wall. MS soldiers in transport. LSs naval transports leaving English coast. MSs crowd, soldiers on boats. LS airfield, MSs airmen loading weapons onto planes, making last minute adjustments. LSs U.S. gliders taking off, in flight. TLSs bombers taking off and in flight. TLS airplanes taking off and in flight. TLS shadow of one of the planes. TLS airplanes in the air from above. LS airplanes in flight (crossing the English Channel toward Normandy). MSs aboard naval ships in preparation. MSs naval ships shelling the coast. MSs airforce on bombing run, dropping bombs. LS/aerial view of explosions. TLSs wobbly gliders in flight and landing gracelessly in wooded areas, wings breaking of on contact w/trees (pretty cool). MCU soldiers in gliders. TLS soldiers rushing out of one of the gliders. TLSs U.S. bombers flying over invading Allied forces. LS naval ships at sea. MSs troops transport by seas. MSs German artillery countering Allied offensive. TLS/pov German positions in countryside from the air (cool shots). TLS from air of bombings, cool stuff. MS airplane bomber dropping payload. LS/aerial view bombins. LS/aerial view naval ships and bomber in FG. MSs soldiers in pontoons and Allied artillery shelling Normandy coast from pontoons. TLSs firing shells. MSs pontoons landing, soldiers storming beachhead, advancing further into coast (good shots). TLS/aerial of airplanes firing on German positions (Great subjective shots Allied planes in combat) bombing key German positions. LS/from above of troops on shore. LSs materiel being unloaded onto Normandy coast. TLS airplane flying low. TLS from stern of naval ship. LS airplanes flying overhead in formation. World War II. LS beach at Normandy (D-Day) with troopships and airship. MSs of tanks rolling out of transport ships. GV foot soldiers and tanks moving along the beach. MS profile of Patton looking through binoculars. CU profile of Patton's waist with a revolver in the gun holster. MS Patton talking to officers in the field. MS soldier turning crank to raise antiaircraft gun into position. CU barrel of antiaircraft gun as it is raised into position. MS soldier on field telephone giving the fire command. Several MSs/CUs of artillery firing. GVs tanks on the horizon. MSs soldiers running across field. MS battle footage with infantry and tank support. Several GV/MS/CUs of tanks firing guns. GV smoking German vehicle abandoned along the road. MSs of German soldiers with their hands up in surrender. MS tanks rolling toward camera. GV troops marching along road. MS tanks rolling along road. MSs of heavy artillery being fired. MSs soldiers firing riffles. GV armed soldiers securing town. CU soldier firing riffle. MS tank firing gun. MS explosion. GVs armed troops securing town. MS German (Axis) POWs (prisoners of war) being marched through town. Wide LS pan of Allied battleships and carriers sailing in the Channel just prior to the offensive. D-Day invasion, June 6, 1944: Communications officers calling to fire; TLS/MSs Atlantic Wall heavy artillery firing, unit soldiers reloading; LS/TLSs Allied naval salvo returning fire, providing landing coverage; TLS/LSs Allied soldiers landing on beach; MS artillery firing from German bunker; MS German soldier firing mortar; MSs German soldiers firing belt-loading MG34 heavy machine guns. Narration, Title Cards and Credits are not availble for licensing. D-Day invasion, June 6, 1944: LS/TLS U.S. soldiers landing, storming beach. D-Day invasion, June 6, 1944: TLS car pulling into German officer's base; panning MS Rommel pacing grounds, hands behind back. Nice TLS view through break in trees, U.S. Army Sherman tank driving along village road. TLSs U.S. soldiers advancing through French coastal town; sideview MS U.S. soldier firing Thompson M1A1 submachine gun; TLSs US tanks in village, speeding along rural road. TLS German Army POWs marching to cam w/ hands held high; TLSs German prisoners of war. LS horde of military aircraft in the sky. LSs of Allied battleships and carriers sailing in the Channel just prior to the offensive. MS's of the navy's big guns hammering the French coast. Cuts between LSs of troop boats cruising & MSs men on the boats. LS/MS of Allied forces storming the beaches of Normandy. MSs of Allied soldiers walking on land, well into the coast. MS of tanks rolling along a dismal and barren French country road. Cut to a CU of a map of the French countryside and immediate bodies of water. From the British Ministry of Information. 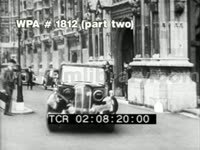 This is a film about an engineering feat put about by the British army: before and during the Normandy Invasion of June 6, 1944, Allied forces built a series of floating causeways and bridges in the English Channel, creating a man-made harbor (code named 'mulberry'). MS of Winston Churchill seated and working at a desk. CU of a special memo on his desk written in 1942 expressing need to build harbor. LSs Harbor being built along coastline, nice shot w/blimp hovering is seen. Establishing view of Chateau Frontenac in Quebec City, Quebec. MS of Churchill and Franklin D. Roosevelt talking at Conference. Cut to good shots of British military installations on English coast securing & defending ports; big artillery guns and the platoons who love them. LS/MS troops on dock securing boats & equipment while rough waters surround them. The Rise and Fall of The Third Reich. Part III - Gotterdammerung: Fall of the Third Reich; based on the classic book by William Shirer. This section focuses on D-Day. Montage of GV/MSs of battle ships firing guns. LS boats moving across water. MS U.S. troops on transport boat. LS Allied boats arriving on beaches. MS gun in brush firing. MS German troops firing machine guns. Several LSs Allied troops advancing toward shore/beach under heavy fire. D-Day Invasion, June 1944: landings at Normandy, some combat footage (including flamethrower). Crowds on London street. CU newspapers talk of the invasion, D-Day. Winston Churchill in black suit, bowler's hat, with cane, watch on chain walking out of building. 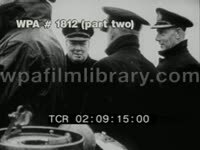 Winston Churchill on naval boat, getting off, smoking cigar. Amphibious vehicle landing on beach. Churchill surveying beach at Normandy (D-Day). Amphibious vehicles on the beach. 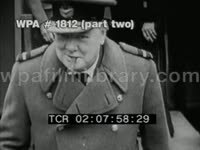 Churchill on boat smoking cigar. Normandy (D-Day).